DOLBY is an interactive application for the visualization of the subject catalog of INCOM. INCOM is the Internet-based communication platform of the Interface Design Department of Potsdam's University of Applied Sciences. INCOM's goal is to improve internal communication among students and faculty as a community informational aggregator of projects, articles, seminars and events. INCOM is developed and produced by students and coworkers of the Interface Design Department, under the direction of Professor Boris Mueller. 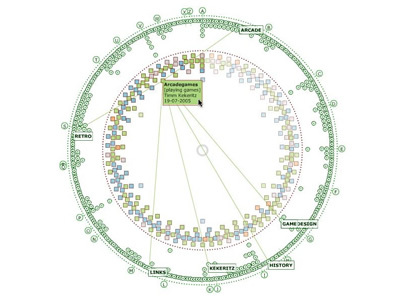 DOLBY maps INCOM's existing key words on a clockwise radial structure, organized alphabetically by small circles. In addition all contributions are represented by rectangles shown in an encircled radius. One can easily rollover a keyword to see which articles relate to it, or mouse over an article and discover the array of associated keywords, and the title and author of the contribution. If an article or specific keyword is clicked, the selection centers itself being immediately surrounded by its related articles/keywords in an ever-morphing constellation. 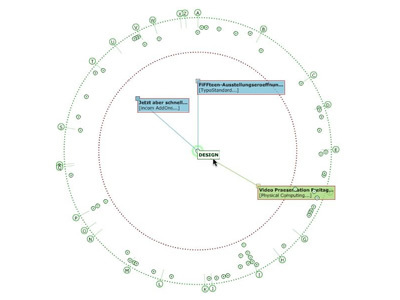 DOLBY visualizes both qualitative and quantitative relationships of the subject catalog of INCOM, and through its visualization it answers questions not fully solved on the INCOM platform.